My daughter is a zebra lover. 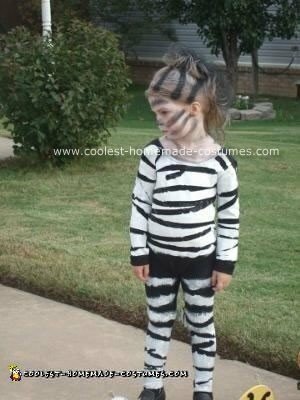 She only wanted to be a zebra for Halloween. The costumes at the store and online were designed for babies and toddlers, she being 5 was not going to fit. So Super Mom to the rescue. After many attempts and failed ideas, EUREKA!!! 1. I took and old black leotard and a pair of black tights from her dresser. 2. Next I stuffed the tights with newspaper and put some cardboard in the leotard so I would have a stiff surface to work on (if you use tights make sure to really stuff the legs big… they will seem to shrink up when the paint dries). 4. Next paint one side of the leotard and leggings. Again zebra stripes are random and imperfect so have fun!! Once dry repeat on opposite side. It may take two or three coats to get the stripes dark enough. Once dry and painted on both sides remove the tape and you have your self a Zebra costume. 5. For the tail I took braided yarn and tied it at the bottom and fringed the end a little. 6. The makeup was simple I just striped random black and white stripes around her face and neck. 7. Her hair which was awesome, I took a banana clip and pulled all her hair up high on her head. A lot of hairspray and coughing later it was standing up high. 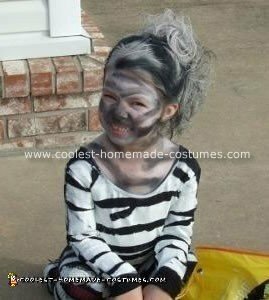 Then as with the rest of the homemade zebra costume, we added some black and white stripes to her hair to top it off. 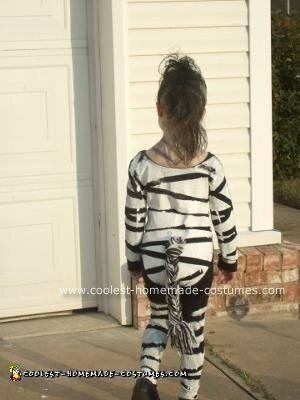 This homemade zebra costume seems like a lot of work but it was well worth it! Total I spent about $10 on supplies!!! Awesome!